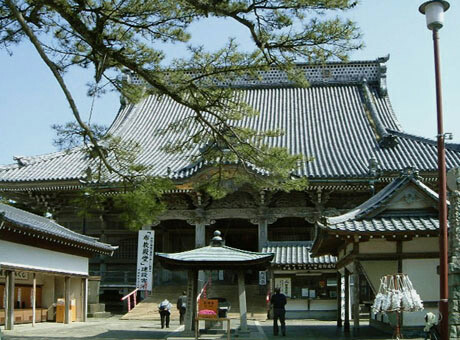 Tanjoji Temple was built in the place where Nichiren Shonin was born. This is a sacred place located in Kominato, in Southern Chiba, surrounded by the Pacific Ocean. Nichiren Shonin was born in 1222. His father was Nukina Jiro Shigetada, and his mother was Umegiku. On the occasion of Nichiren Shonin’s birth, legend has it that lotus flowers bloomed on the seashore, a large number of red snapper gathered, and spring water gushed out into the yard of the house. These places are now preserved as Renge-ga-fuchi, Tae-no-ura, and Tanjo-ido. After Nichiren Shonin proclaimed his new path of Buddhism, he continued his mission in Kamakura, but in January of 1264 he learned that his mother was ill and returned to his hometown. He inscribed a mandala and prayed for her recovery. Because of his great merits, his mother lived for another four years. In October of 1276, Nichike, one of Nichiren Shonin’s second senior disciples, built a temple on the grounds where Nichiren Shonin’s parents’ home stood. The patron of this temple was Sakuma-Hyogo-no-kami Shigetada. The temple was originally at the place where Tae-no-ura is currently located, but in August 1498 the temple was destroyed by a tsunami. The temple was rebuilt, but the second temple was also destroyed by a tsunami in November 1703. During the Hoei Period (1704-1710), Nichiko rebuilt the temple at its present location. 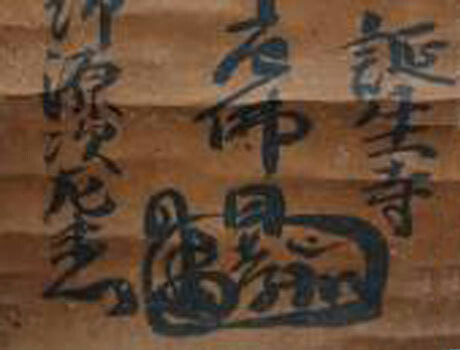 At that time, a local lord donated the property.